1 – In the summer of 2007 my cousin Emily was living in San Diego. We’d been messaging back and forth, and when she threw out the idea that I might come visit her, I jumped at it, bought the ticket almost immediately. I’d been working full-time and taking a break from school, and despite having flown to Europe for the first time only months prior, I had money in the bank. It felt good, like a taste at being a grown-up. I remember this trip as the first time I’d ever really understood or appreciated that being from Utah made me different, and interesting. I remember marveling at the way people drove even the shortest distances, trying to watch Harold and Maude but falling asleep, Emily’s big plans for post-graduate life and feeling so uncertain about going back to school and not, after much hullabaloo, moving to New York to do CityYear. I wrote a letter to my brother, still in the Navy at that time, on the airplane home and then never sent it. We talked about getting tattoos together, me and Em. On my last day there, we went to visit some old boat, I don’t even remember the name. Just that we paid a small amount, had our wrists stamped, and enjoyed a brief tour and ride around the bay. 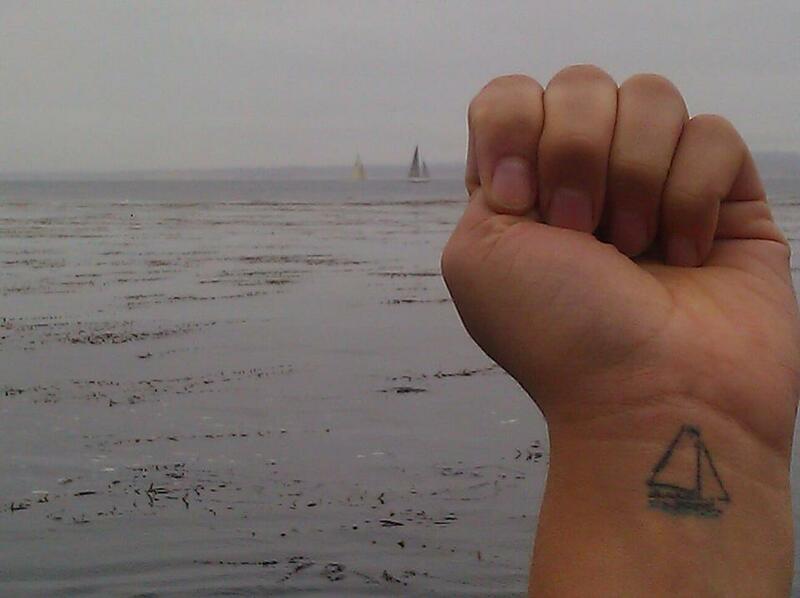 The stamp was cute as hell, a little sailboat, and we walked around after looking for tattoo shops to make something permanent of it. But then we realized there was no time, I had a plane to catch, and that was that. Until last January, when I was going through all of the memorabilia I’d accrued over the years, shedding emotional layers. I’ve become less and less sentimental as I get older, but still there was this great big box of notes passed during 8th grade Geography, get well soon cards, high school dance photos. One of my ex’s dreadlocks, whatever. AND…(and)…the receipt from that day on the boat. With the stamp on it. So then a few months later I was in New York, Emily’s new home base, leaving a party early to sneak off and pay too much to have a needle stabbed into my wrist skin, even though Emily didn’t join me. It’s a decision I’ve never regretted, and it pleases me every time I look at it. 2 – I think I knew somewhere deep down inside that I would be far less likely to slit my wrists if I had to cut through something so delicate and precious. My little sailboat. We are all of us vast oceans of experience and urges, containing multitudes and contradictions. We are none of us all good or all bad. We make mistakes, break hearts, kiss it better, try again, and if we’re lucky we learn something. We learn what’s important. For example: telling the truth(s).